Christmas is just around the corner, who's ready for some fun? 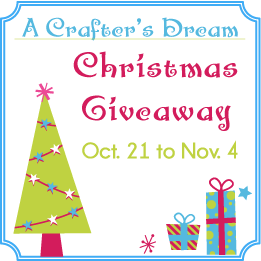 I've joined up with 50 other wonderful bloggers to bring you A Crafter's Dream Christmas Giveaway! This giveaway is hosted by My Merry Messy Life, Earning-My-Cape and Tutus & Tea Parties and has a Christmas, crafting, and supporting small business theme! Each blogger is offering her/his own giveaway worth $25 or more going on now through Sunday, November 4, 2012. So, who's ready for Christmas? If you are like me and want to give a handmade gift, but just don't have the time or know-how to make them. This is a great opportunity to support small businesses and shops who offer handmade items! Some of the blogs in our giveaway group will be highlighting such small businesses and offering giveaway items for them, as well. More reminders to celebrate my Savior!!! Getting together with our families. Jesus is the REASON for the season! Thanks for the chance to win! Thank you for joining my giveaway, and thank you for the info on yours. I joined! And I love the lights! I love decorating but I miss my family! I love seeing all the different decorations & spending time with my family! Thank you for the great giveaway! My favorite thing about Christmas is all the lights outside at night. It's gray and dreary but the twinkling lights just cheer me up. terri.moore30@yahoo.com thank you! Getting together, and having fun! my favorite part about christmas is watching my kids excitement on christmas day. such a blessing. Favorite thing about Christmas is the church music. Call me crazy but I love wrapping my kids gifts and putting them under the tree! Family is #1! My favorite thing about Christmas is celebrating Jesus' birth! Thanks for the giveaway! My favorite thing is being with all my relatives who I only see once a year. My favorite thing is celebrating the birth of Jesus Christ. I like making all the Christmas treats. Family being together in the name of Jesus Christ. I love the movies and tv specials! My favortie thing is seeing my daughters experience the joy of Christmas. New follower via the giveaway. My favorite thing about Christmas is decorating. The best thing about Christmas is celebrating the birth of Jesus. Celebrating Christmas with Family & Friends!! Thanking God for the Gift of His only son....Amen! My favorite is purchasing gifts at great prices, then giving them to my family and kids. Thanks. All the little traditions that point people to the Savior. Spending time and Baking with my children. Spending time with family & chatting about the year! My fav thing about the holidays are family and food. I like giving personal gifts and the lights. Being with family,Holiday activities & shopping for my family. Having family time together - thanks! Wow, thanks for the great list of giveaways. Love your blog by the way. I love the decorations and lights everywhere! Sticky buns and coffee at our daughter's house watching the grandkids open their presents. Seeing family members who I don't see often. My favorite thing about Christmas? The smell! no school and hanging out with my parents. Seeing the magic and wonder in my kids eyes! Oh, and all the yummy goodies! Stopping to realize why we celebrate Christmas & sharing it with the family. I love decorating, cooking and shopping! hanging with family and eating Christmas cookies! my fav is the decorations!!! My favorite part is that feeling of peacefulness I always get, especially on Christmas Eve, at church. It seems that, if only for but a moment, all is right in the world....it truly is a Holy night. I love finding just the right thing for a gift, the decorating, crafting and food of course! Gathering with family and friends. I love that the family makes more time for each other around the holidays.